Anyone who’s seen “War Horse,” an extraordinary piece of storytelling for the stage that features life-size horse puppets, knows the name of the Handspring Puppet Company. The South African organization has been around since the early 1980s, and has been making prominent pieces of theater around the world ever since. But “War Horse” is the show that really put the Handspring on the map. Kind of like what “Sleep No More” has done for Punchdrunk. There is some powerful puppetry at play in the company’s 1997 production “Ubu and the Truth Commission”, currently showing at Zellerbach Hall in Berkeley under the auspices of Cal Performances. 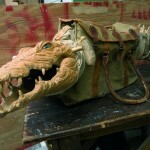 But even a snappy crocodile purse (pictured here) and a three-headed-dog-suitcase puppet cannot bring this heavy-handed diatribe of a theater production to life. Written by Jane Taylor and directed by William Kentridge (who also provides fanciful-grotesque charcoal animations projected on a screen at the back of the stage) this multimedia spin on Alfred Jarry’s late 19th century absurdist drama “Ubu Roi” blends Jarry’s violent and obscene protagonists, Ubu and his wife, with the testimonies of witnesses at the post-apartheid Truth and Reconciliation Commission (TRC). The TRC was a judicial body that was created in South Africa after the abolition of apartheid to give voice to those who identified as victims of human rights violations as well as the perpetrators of violence. The small size and fragility of the human witness puppets and understated presentation of their apartheid stories (spoken in African languages like Zulu and rendered into English in a neutral tone by a translator sealed in a box) contrasts dramatically with the overbearing, violent and over-sexualized depictions of Ma and Pa Ubu. There are all kinds of layers of meaning locked in to this show. I suspect many of the ideas are lost in time and geography at this point. 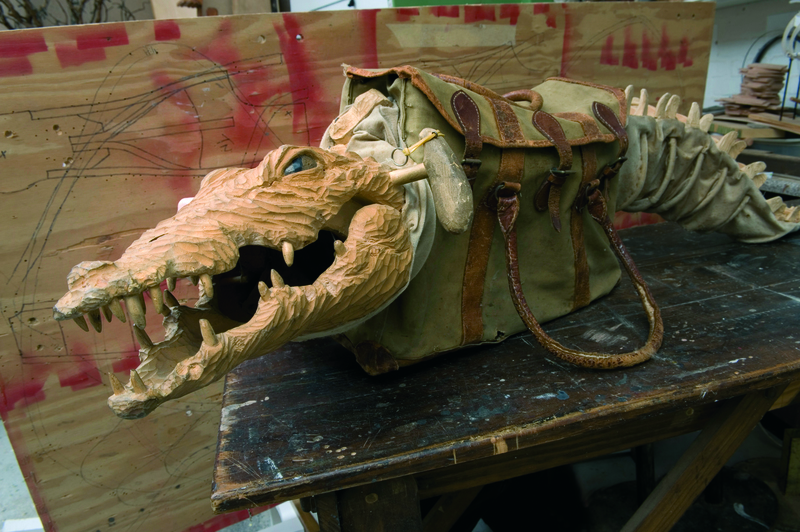 For example, knowing that the canvas kit bag used as part of the crocodile puppet belonged to the father of company member Basil Jones who used it during his military service adds to the sinister undertones of the piece. But the politics of the piece are so didactic and overbearing, that I found myself switching off.